If you want to instill a life-long love of learning in your family, one of the best and most fun ways is travel. There’s no better education for children of all ages than a real taste of the great wide world and its delights: new foods, people, languages, and cultures. Before we visited France, my children were picky eaters. But the more we traveled, the more they were forced to try new things. They even grew to love some of the very veggies they refused back home. My daughter’s first complete sentence was spoken in Paris, inspired by a mouthful of Nutella chocolate crepe. “I like it,” she said in a husky, chocolately tone I’d never heard from her before. My son echoed her sentiments. Delicioso! he said. An Italian word I had been trying to teach him at home to no avail. But in Paris all things were possible. In those few weeks, my children grew up. A certain confidence took hold. They became citizens of the world. We all did, sharing the transformation of new experiences together. My son even said he was going to come back to Paris and live there when he grew up. He loved the motorcycles, and the crepes, of course. The logistics of traveling with young children can feel overwhelming, whether you are going near or far. We become Sherpa moms with giant bags and backpacks, baby slings and bottles. The younger your children are, the more tempted you may be to stay at home until they are eighteen and can drive you to your destination. But life isn’t about waiting for the perfect moment. There are many perfect moments and sometimes the most imperfect moments turn out to be the best. The secret to travel is plan well, and be prepared to let it all go out the window, if necessary. Go with the flow and travel light. Try not to over-pack or under-pack. If traveling by plane, pack a carry-on ziplock with medications your children might need, such as infant fever reducer, throat soothers, gas or allergy relief. Be sure your Magic Mommy purse has separate compartments for travel documents, baby bottles, kid treats and travel toys. I use one carry-on suitcase for both children. That way all kid items are on board and handy, including comfort favorites like pillow, blanket and snuggly bear. 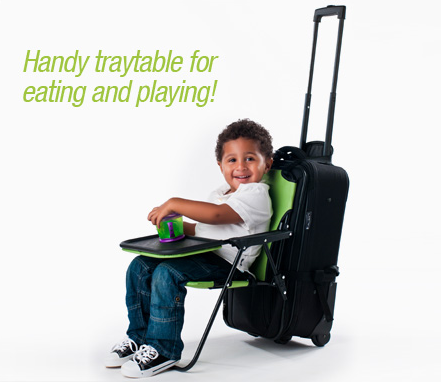 The “ride on-carry on” must have been invented by a savvy on-the-go mom. Perfect for airport travel, it combines a carry-on bag with a stroller, solving a number of traveling mommy challenges in a single go.